The American Racing Pigeon Union registered bands have a specific format. Once you understand how to read the band number, you will find it easy to locate the club that issued the band on our Band List page. Make sure to visit our page on How to Care for a Found Pigeon. 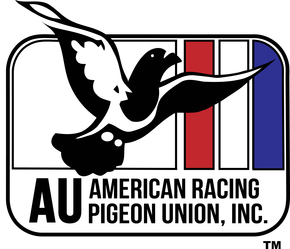 (1) - AU - is the national organization that has registered the bird, in this case the American Racing Pigeon Union, Inc. The band can also have IF, CU, ATB, NBRC, or IPB in this position. (3) - ABC - is a letters representing the pigeon club the band is registered to (no two clubs have the same registration letters - and they have one, two or three letters). (4) - 1234 - A one-up number unique to each pigeon based on the club letters. Now that you understand how to read the band, you can go back to our band list to find the club that the bird you found belongs to. To help make finding the owner of a found pigeon easier, please enter only the letters that follow the year on the band. Then scroll down the list until you find the club letters you entered. In the example below, the letters to enter are XYZ. AU (our organization) and the year the bird was born and banded (2003). Also note, the "Club Code" is XYZ and the number that follows is the bird's id number. If the band does not have an AU , or one of the above mentioned organization letters on it, send us an email .We will do our best to help you find the owner of the bird. If the bird has no band at all, It is a wild pigeon..... Contact your Local Humane Society. Thank you for taking the time to care for found pigeons.